Beauty is in the eye of the beholder. The human face is composed of a complex intermingling of tissues arranged in layers. Measurable facial asymmetry exists in normal individuals, and, on most occasions, these discrepancies are overlooked and often perceived as attractive. Several factors can contribute to this illusion of a perfect image and it is important to appreciate the role of flawless skin in masking the underlying deformities of the face. Delicate skin with even tone and texture can distract the observer from the minor faults beneath the skin. 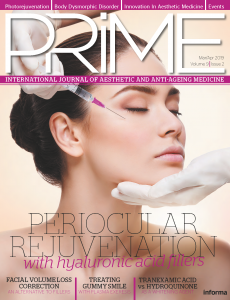 The importance of skin care and the role of cosmeceuticals in anti-ageing treatments have been well acknowledged. Skin care has become an essential part of the daily routine and is recognised as an effective tool against the ageing process. As perceived in the past, anti-ageing treatments are no longer restricted to the Baby-boomers. The younger generation are becoming aware of the importance of routine skin care in maintaining a youthful appearance and to decelerate the ageing process. Novel additions to this group are men, who express an enthusiastic interest in grooming and anti-ageing treatments. The skin care and cosmetics business is a multibillion-dollar industry that thrives on the unending expectations and needs of the customers. A wide range of skin care products, with a multitude of claims and promises, currently occupy the supermarket and pharmacy shelves. The customers often pick and choose products according to their ability and judgement. It is a trial-and-error process and on most occasions it is not a successful venture. Even though skin care is one of the important components of the facial rejuvenation process, the clinicians are often not involved in enlightening the clients to choose the suitable product. Conventionally, skin care products have been made for four basic skin types, classified as normal, dry, oily and sensitive. Specific formulations are produced for problematic skin conditions, such as acne. Many researchers classified the skin based on different variables. The classifications were mostly based on genetic disposition, reaction to sun exposure and cosmetic interventions, and the tanning properties of the skin. The historical classification of the human race is based on the three major continents. Accordingly, three races were identified, which are the Caucasian race from Europe, the Mongoloid race from Asia, and the Negroid race from Africa. This basic classification was further extended into five groups, which included the following races: Caucasoid, Negroid, Mongoloid, Australoid, and Capoid. The new genetico-racial skin classification presented by Fanous et al., highlights the importance of incorporating the genetic and racial origin of the patient during assessment1–3. The authors’ observation on the ‘north to south’ phenomenon that depicts the change in skin colour and features across the globe formed the base for this classification. The important variables that were taken into account were the colour of the skin, thickness of the skin, and facial characteristics. Accordingly, six genetico-racial subtypes were described from the three founding races (Table 1). The authors highlighted the importance of the role of genetics in determining a patient’s response to medical and cosmetic treatment1–3. 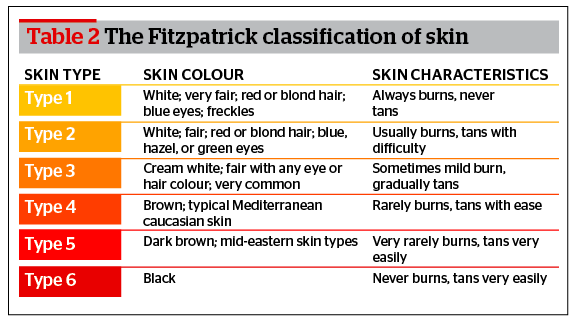 The most popular classification system is the Fitzpatrick classification, which is based on genetic background and skin reaction to UV light exposure (Table 2). The classification is considered as the gold standard and a simple guide to predict outcome of therapies and risk of skin cancers4. Later, many similar classifications were developed based on the complexion and characteristics of the skin. The Robert’s skin type classification system evaluates four important elements: phototype, hyperpigmentation, photoageing and scarring. This system helps to predict the skin’s response to injury and insult from cosmetic procedures and helps to predict impending complications5. The Obagi skin classification considers five important variables to classify the skin. These include the skin colour, oiliness, thickness, laxity, and fragility6. The Kawada skin classification system analyses Japanese skin types based on personal history of sun reactivity. The Glogau scale considers the degree of photoageing, wrinkling, and discolouration of the patient’s skin7,8. The system is not applicable for mixed race individuals. Other classifications include the Lancer ethnicity scale, the Goldman world classification of skin types, the Willis and Earles scale, the Taylor hyperpigmentation scale, and the Baumann skin type solution9–12. The Willis and Earles classification is especially designed for people of African origin. Most of the systems consider the genetic and racial origin as an important factor in the classification. In the clinical practice, the skin types are correlated to post-procedure outcomes after diverse dermatological and surgical procedures. The properties of the skin and its response to external stimuli are largely determined by its genetic origin, which is responsible for the variable reaction of the skin to different physiological and pathological situations. The racial characteristics of the skin are also responsible for the disparities in the transcutaneous absorption of drugs and lotions13,14. The properties of the skin among the different races were investigated in great detail in the past. The content and distribution of pigments is the most important factor that determines the primary variation amongst the races. This variation depends on many factors, such as quantity of melanin, melanosome content, type of pigment, and the extent of UV exposure. The light colour in Caucasians is mainly due to haemoglobin and oxy-haemoglobin, whereas carotenes can be a source of yellow hue in some races. The shades of brown and black colours are produced by varying amounts of melanin and its distribution in the skin. The quantity and type of melanin and the dispersion of the melanosomes are responsible for the difference in skin pigmentation15–18. Another important factor that determines the reactive properties of the skin is the variation in the structure of the stratum corneum19. Even though some studies demonstrated the presence of more corneocytes in darker skin compared to lighter skin, there was no significant difference in the thickness between these groups. It has been a constant observation that the cell layers in the dark (Negroid) skin were more compact; leading to a greater intercellular cohesion20–22. Even though there was no significant variation observed among the races, the darker skin subjects are shown to have a higher rate of desquamation. The quantity, quality and size of the corneocytes are well correlated with epidermal hyperproliferation and the development of dry skin23–26. The trans-epidermal water loss is the total amount of water vapour lost through the skin and appendages under non-sweating conditions. Several studies compared the trans-epidermal water loss among different races27. It has been reported that trans-epidermal water loss is greater in darker skin compared to fair skin. Studies on Asian subjects were variable. Similar studies on the water content of the stratum corneum revealed variable outcomes27. Apart from the pigmentation and melanosome content, variations in the dermal structures were also observed among the races. The dermal structure, viscoelasticity properties, and the distribution of the skin appendages differ among ethnic groups. Darker skin types have a larger pore size, increased apocrine glands and secretions with the highest level of microbial flora. The ceramide levels of the skin are related to moisture and the protective function of the skin. It has been shown that Asians have higher ceramide levels than those with darker skin types28. The variation of the epidermal-dermal structure has an impact on the photoageing pattern of different races. nd Japanese females revealed that the wrinkles and facial sagging were more prominent in the former group30. Among many other risk factors, ultraviolet (UV) radiation is one of the most important contributory factors for skin cancers31–33. Well-pigmented darker skin types have an inherent protection against developing skin cancers compared to lighter skin types. This association is clearly correlated with the Fitzpatrick skin types. The risk is also related to the sun-seeking habits of those with lighter skin types34. Cosmeceuticals play an important role in the rejuvenation of the skin. An array of skin care products and cosmeceuticals exist on the market, each with their own merits and claims about providing superior-quality skin care. Despite the extensive availability of these products, the constant, tireless search for newer products never ceases. Cosmeceuticals contain active ingredients that have an impact on the skin both aesthetically and therapeutically. The common types of cosmeceuticals are alpha hydroxyl acids, antioxidants, peptides, retinoids, sunscreens, and de-pigmenting agents. This group may also incorporate the moisturizers and exfoliants. The active components in these products have predictable results on the skin. According to the author, sunscreens should be considered the most important component for skin care. Regular use of sunscreens protects the skin against UV radiation, thus inhibiting photoageing and skin cancers. An efficient sunscreen contains ingredients that provide protection against UVA and UVB radiation. The common ingredients used in the broad-spectrum sunscreens are benzophenones, cinnamates, sulisobenzone, salicylates, titanium, zinc oxide, avobenzone and ecamsule35–37. Antioxidants reduce free radical damage and are often incorporated into anti-ageing products. Common antioxidants include L-ascorbic acid, niacinamide, alpha-lipolic acid, N-acetyl glucosamine, alpha-Tocopherol, and ubiquinone. L-ascorbic acid (Vitamin C) is a powerful antioxidant that can improve fine lines and reduce pigmentation38–40. Alpha lipolic acid acts as an exfoliant and when applied topically helps to restore smoothness to the skin. Regular use of niacinamide has shown to improve the discolouration and pigmentation changes in the ageing skin41,42. N-acetyl-Glucosamine is a stable form of glucosamine that can be used to combat photo damage and interrupt the chemical signals that causes melanin production. Alpha Tocopherol (Vitamin E) reduces the effects of acute sunburn and neutralizes the free radicals. This is often combined with Vitamin C to provide an effective protection against UV radiation43,44. Ubiquinone is a powerful antioxidants that can supress expression of collagenase following UVA radiation and therefore reduces the collagen breakdown. These ingredients are used in combination in many formulas that have shown to produce a synergistic effect on the skin45,46. The alpha hydroxyl acids (AHAs) are becoming popular additions to skin care formulas. These are mainly fruit acids and examples include lactic acid, glycolic acid, citric acid, and malic acid. These components mainly act by promoting shedding of the cells and restoring hydration47,48. The exact mechanism of action of the AHA’s is not known. It has been postulated that these compounds act by reducing the calcium ions in the epidermis. Removal of calcium ions results in disruption of the cell adhesions and therefore desquamation. The reduced calcium level on the skin slows down the cell differentiation and promotes cell growth. A recent study performed with anti-ageing products containing AHAs and vitamins reported on the improved biomechanical parameters of the skin49–51. Skin lightning agents are one of the most desired cosmeceuticals, especially by the darker skin races. The topical treatment for hyperpigmentation is aimed at reducing the production and distribution of epidermal pigments. Hydroquinone is still considered as the gold standard topical agent. It acts by inhibiting the enzyme tyrosinase, thereby reducing the conversion of DOPA to melanin. The other possible mechanisms of action are the destruction of melanocytes, degradation of melanosomes, and the inhibition of the synthesis of DNA and RNA52,53. Some of the other skin lightening agents includes ascorbic acid, kojic acid, and arbutin. Kojic acid is a naturally occurring hydrophilic fungal derivative evolved from certain species of Acetobacter, Aspergillus, and Penicillium. It acts by inhibiting the production of free tyrosinase with efficacy similar to hydroquinone. Arbutin is a naturally occurring plant derived compound that has been used for post inflammatory hyperpigmentation, also known as β-D-glucopyranoside, it is a derivative of hydroquinone54,55. Retinoids are the most investigated compound used in cosmeceuticals. These are either natural or synthetic derivatives of vitamin A and include retinoic acid, retinol, and retinaldehyde. Retinoic acid (Tretinoin) is a potent anti-ageing compound that is used to treat wrinkles and hyperpigmented spots56,57. Retinoids can be used as a monotherapy but the efficiency is shown to improve when used in combination with hydroquinone58–61. Unlike most other cosmeceuticals the effect of the topical de-pigmenting agents has been analysed extensively. Even though hydroquinone is considered as a potent depigmenting agent its use is restricted due to the potential complications such as ochronosis, permanent depigmentation, and potential carcinogenicity62. The botanicals and related compounds form the major portion of the cosmeceuticals and are used extensively. Many of these compounds have a clinical effect but mostly unsupported by any studies63. The ageing process results from the interaction between two main factors: the intrinsic factors (genetically determined) and the extrinsic factors (environmental). The response of the skin to this process depends on the interplay between these two factors. The genetic composition and therefore the ethnic background of an individual largely determine the outcome of the ageing process. tion, and other ageing related complications. Even though it has been acknowledged that the genetic properties of the skin can play an important role in evaluating an individual’s response to dermatological interventions, the importance of incorporating this principle in the selection of cosmeceuticals has not been explored. a specific skin type, based on the ethnic and genetic background of the individual. >> Some races have a tendency towards keloid formation. This categorization highlights the differing photoageing pattern among the races and the skin’s reaction to physiological and pathological situations. It also depicts the problems specifically related to people from various ethnic backgrounds. Based on these facts, the author suggests that the active ingredients of the skin care products could be selected to target the concerns specific to each group. The active ingredients can be incorporated into the daily skin care products for maintenance, prevention, and treatment of the specific problems identified in each category. 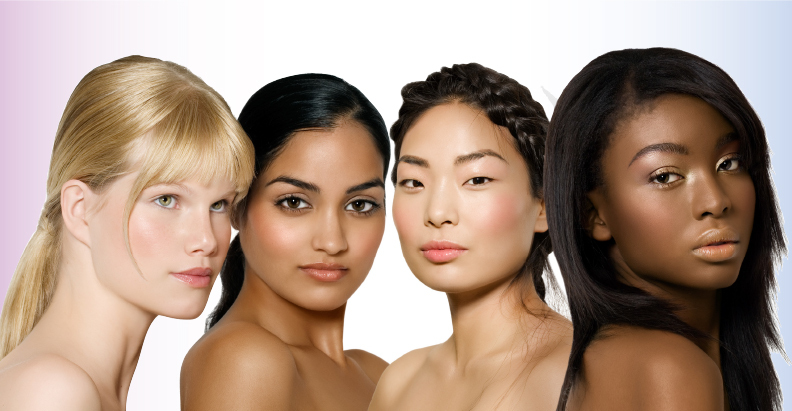 Existing products in the market are directed toward the basic skin types but are expected to produce results in all races. Discerning consumers pick and choose products according to their ability and judgement, and it is often a trial-and-error process with a long learning curve, and significant financial commitment. On most occasions the consumer uses the chosen products continuously for many years. It has been a constant observation that the clinical response of the product may plateau or decline with continuous usage, as the skin become acclimatized to the ingredients. The author’s pragmatic approach to skin care may help to overcome this hurdle of confusion in selecting the suitable skin care line for an individual. Common cosmeceuticals such as antioxidants, peptides, and moisturizers will be beneficial for all skin types. The effective combination of these active ingredients in the best possible proportions for each group is the key for success. Sunscreens are the most important component in the daily skin care regimen as it is a preventive tool against skin cancers. They are also necessary in retarding photoageing effects in all the skin types and preventing UV ray induced dyschromia in the tan and darker skin groups. Based on the previous findings it has been observed that darker skin types have a compact epidermis with an increased rate of desquamation and increased trans‑epidermal loss of water. It is therefore rational to incorporate rich moisturizers for the darker skin races to address the dry and cracking skin. AHA based products help to promote cell shedding and restore hydration. Adding regular exfoliants in skin care may be beneficial for darker skin types. Care should be taken to avoid harsh abrasives as these may lead to skin irritation and post inflammatory hyperpigmentation. 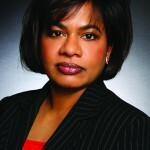 One of the main concerns in darker skin types is dyschromia and uneven skin tone. Skin brighteners and bleachers that suppress the melanin formation may be incorporated into the skin care products. Blending these agents with an early introduction of antioxidants may help to prevent or delay the process of pigmentary changes in this group. The depigmenting agents such as hydroquinone should be used with caution due to the possibility of developing complications, such as ochronosis. The main concern of the fairer skin group is the development of wrinkles at an early stage. Many cosmeceutical ingredients such as retinoids, peptides and growth factors are known to address fine wrinkling60,61. Tropical retoinoids such as tretinoin have been shown to increase the collagen content in the upper papillary dermis, thus helping to smooth out fine and coarse wrinkles. 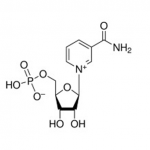 Peptides are proteins composed of long and short chain amino acids. Some of the penta and hexa peptides are known to have a stimulatory effect on collagen production38. It may be beneficial to integrate these compounds in the skin care routine of the fair skin groups. The variable pattern of ageing among the tan skin group poses a challenge in selecting the appropriate cosmeceutical. The pigmentary changes such as melasma and freckles are becoming a noticeable problem among ageing Asians. When compared with the fair skin types this group have fewer tendencies to develop wrinkling and sagging of the skin. 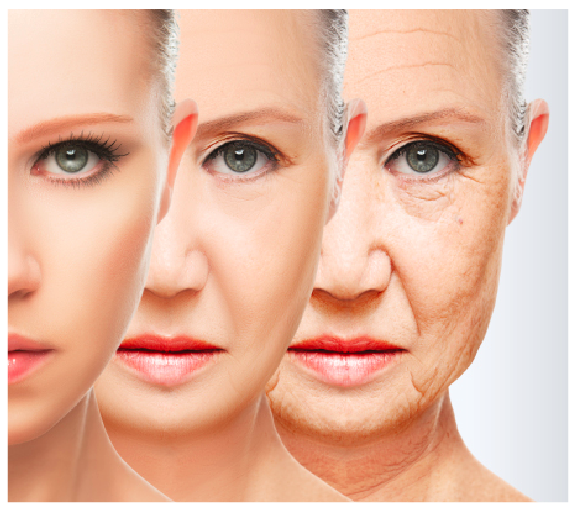 Moderate wrinkling related to photoageing has been observed in the older groups29. Therefore a mixture of active ingredients may be necessary to address these issues. Climate and geographic changes can have an impact on the skin, and the resultant problems vary with seasonal changes. Global migration and resettlement has resulted in unpredictable responses to the photoageing and climate changes in all races. Rain and wind dominate the fall season leaving the skin dry and flaky. The cold winter causes more dryness and the skin may benefit from rich moisturizers and replenishing night creams during these seasons. In the summer the air is more humid and moist. It may be rational to incorporate antioxidants such as L-ascorbic acid, niacinamide and alpha-lipolic acid to protect against UV radiation. Use of sunscreen is recommended during all seasons, and should be especially emphasised during summer as many are engaged in outdoor sports and travel. Constant use of the same product with similar ingredients for a long period may lead to ‘tiredness’ of the skin, and when the skin reaches this stage it becomes less responsive or even non-responsive to the product. Altering the ingredients according to the needs of the individual based on the ethnic background and seasonal changes could be a rational approach. This pragmatic approach to the skin care not only provides optimal treatment but also prevents acclimatization to active ingredients, as it may lead to a ‘skin confusion’ state in which acclimatization to the same ingredient is avoided, leading to a superior response to skin care products. Swapping ingredients that are suitable for various seasons helps to target specific concerns related to the seasonal changes. It will also helps the skin to recover from stress and the long-term side effects of the treatment compounds in the products. The ethnic background of an individual plays an important role in determining the response of the skin to the intrinsic and extrinsic ageing process. Cosmeceuticals and skin care products are the prime tools for the maintenance of ageing skin and to impede the ageing process. Optimal outcome can be achieved by targeting problems specifically related to the diverse ethnic groups. Judicial selection of the active ingredients based on the ethnic background and acclimatizing the skin care to the seasonal changes is imperative for optimal management.